Winter is a challenging time for drivers, as sub-zero temperatures lead to potentially dangerous road conditions. Ice and hail are two of the main hazards to look out for. However, preparing adequately and driving appropriately will help you stay safe. Read on to find out how. Remember that tyre grip is hugely reduced on icy roads, and braking distances are much longer. Anticipation and smoothness are key for driving on icy roads. Look well ahead for potential hazards – including, of course, patches of ice – and keep your speed well down. A higher gear may be more appropriate to aid grip on packed ice. This helps manage engine power delivery, making it easier to find traction. If it’s a manual, you might need to slip the clutch a little to prevent the car from stalling. Many automatics will let you select second gear at a standstill to pull away in. What is the braking distance on ice? Braking distances can increase tenfold on ice compared with a dry road. For this reason, you should leave up to 10 times the normal recommended gap between you and the car in front. Remember that tyres grip less efficiently in cold conditions. So even if the temperature is above zero and there’s no ice on the road, you should take extra care. Winter tyres offer more grip and can significantly increase performance in icy conditions. 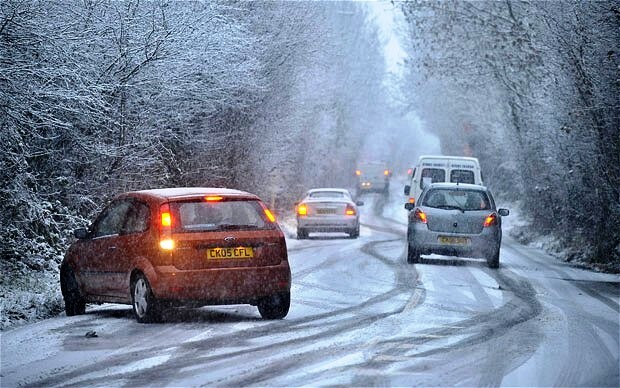 For more advice on this topic read our guide to buying winter tyres. Black ice is a thin layer of ice on the road surface. Because it is smooth and transparent, it appears the same colour as the road below. This invisibility makes it particularly dangerous for drivers. As a guide, if the temperature is low and the road surface looks ‘wet’, be careful and drive with caution as it could be black ice. Sometimes black ice appears as a glossy sheen on the road. You may see it glinting in the sunlight, or spot cars ahead swerving for no obvious reason. However, it’s likely you won’t see black ice at all, so be particularly cautious on shaded stretches of road, bridges, flyovers and tunnels – anywhere the surface temperature may be lower. Quiet roads are also more likely to be affected. If you hit a patch of black ice, don’t panic. Keep the steering wheel straight and maintain your speed – don’t hit the brakes. Use the gears to slow down if necessary, but avoid any sudden movements that could destabilise the car. If you do encounter a skid, steer gently into it. For example, if the rear of the car is sliding to the right, steer to the right. As above, do not take your hands off the steering wheel or brake hard. If you have to travel, plan your route to avoid known affected areas. We also recommend informing relatives and friends of your intended route in case of an emergency.